Very good video regarding Tree Management Programs around fine turf areas of the course from the USGA. The following story was on the golf channel a few months ago regarding golf courses and water usage on the west coast. This story is playing out all over the country as sustainability of clubs and its management of resources are continuing to be evaluated. Great weather, come see us. Not bad on Friday but above normal mid-50's on Saturday. Come out and see us. Cleaning up leaves that fell after snows of the last couple of weeks. Course is looking good! 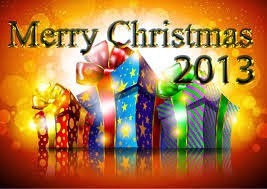 Merry Christmas to you and your families during this special season. Hopefully through all the hustle and bustle, you have some moments of solitude and reflection. Thanks for all the support you give our staff's at Glen Echo. The course will remain closed due to wet conditions. The course received 1" of rain which was very much needed to bring the moisture levels up in the soil. Low moisture levels in winter can lead to drier conditions like we had for the season of 2012 which could contribute to monster water bills! It can also lead to damage to turf, trees and ornamental plantings due to low levels of moisture in plants and severe cold. Not a difficult call to make this morning with rain predicted all day, the course and practice areas will remain closed all day on Saturday, December 21st. Due to severely wet conditions, all golf facilities will be closed on Friday, Dec 20th. Range balls will plug in the mud and greens are foot printing and bringing up moisture when walked upon. With no drainage lines in our greens, limited evaporation potential, and slippery playing conditions on all other surfaces of the course, the proper choice is to keep the facilities closed. We are sorry for any inconvienence this creates for you. I'm a golf green, not a sponge! Course will remain closed. The warm weather of the last two days has eliminated most of the snow cover on the golf course. We still have a few greens that are covered and the overall conditions are too wet for play. Below are a few pictures I took this afternoon that illustrates the problems we are still facing on the course. Greens 5 and also had minor accumulations of snow still on the greens. The rough and fairways areas are completely saturated from moisture and are dangerous for foot traffic as well. Walking on cart paths without clubs will be the only activity that will be allowed on the course at this time. We are sorry for any inconvenience this creates for you. I am a golf green but more like a sponge at this time. Practice green and water coming up from my step. 3 green covered in snow and water. 4 tee sloppy from snow and water. The airport reported about 4.5" from the weekends storms which is about what we had here at Glen Echo. There was some snow and ice on the ground from the weekend before which added to the total Nice warm temperatures the next couple of days but 99.9% chance that we will remain closed because of the snow, frozen and melting conditions. The view from the main road looking toward #7 and the Field Bar. The staff have been working on the Lean to Building doing some clean up and removing some old carts that are no longer in use. The engines were blown and we made the choice to not put them back in service. Parts are being removed for future use on similar carts that are still operational and the rest of the unit will be sold as scrape. The front cover of this cart will be used on another cart. The remaining front end will removed in case we need in the future. The doorway to the pallet-ed fertilizer area does not allow our backhoe with forks or delivery equipment from our vendors to enter into the building. 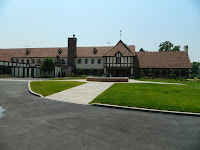 The building was constructed before I arrived in 2008. The door entrance will be raised to the ceiling allowing taller lifting equipment to maneuver within the fertilizer storage area. The entrance to the fertilizer storage area. The header board frame will be removed giving us a couple of extra feet of head room for loading equipment to enter and exit. Fertlizer storage area after guys cleaned things up yesterday and arranged. We could have up to 6-8 pallets of additional material in the building during spring and early summer. I had failed to put the last few month's weather stats on the site so here they are for September through November. A much warmer than normal September led us into an average October and below normal temperatures closed out November. The moisture levels began to lessen in September and continued the trend into October and closed out as the 16th driest November ever. As all of you know, our Controller Mary Martin has accepted a new position and her last day is Friday, December 13th. She has worked here just short of 4 years but her impact to our operation has been great not only from a work standpoint but as a person. She started under some tough circumstances but rolled up her sleeves and jumped right in. It took her a few months to get things under control but she hit the ground running and has not stopped since. She was new to the golf business but was a quick learner. She was committed to the membership and her teammates. She went above and beyond in her short time at Glen Echo. Halloween hayrides, Breakfast with Santa, Summer holiday gatherings at the club were just a few of the extra duties she took on and helped to launch the book club with Heather. A testament to her contribution was an overflowing room full of book clubbers and spouses for the final book club meeting that had to be moved out into the main banquet area. Thanks Mary for your contributions to Glen Echo CC. You will not be forgotten! your packing up Here and departing for There! The Heres behind are bummed to the max. you'll be warmly remembered and mournfully missed! that a big piece of Here will be going with you! when you've arrived There and completed your quest. remember those Here wish you only best! This was posted on one of the Superintendent web boards I checkout regularly. Think we might gain some interest from the youngsters with this game? Looks interesting. Maybe an off season event at the club. We thought winter had set in the last couple of weeks but the temperatures moderated over the holiday weekend and early this week which forced us to change some of our plans. I thought I was finished mowing greens for the season but they were a little longer than I like so they were mowed on Monday. We sprayed our last fungicide application for the season today that will keep our greens clean throughout the winter months. The staff will be bringing in most of the course supplies over the next couple of days. We will finish placing two holes in each green today. The hole locations will be located either in the front, middle or back depending upon the flag color and the second hole will be located across the green from the first hole at the same depth as the first hole location. Please move the flag stick to the other hole after you have completed holing out. This will help us during winter to spread wear and tear over two hole locations instead of one since the greens usually freeze enough to prevent us from changing holes. We will also be removing the tee markers and broken tee caddy's to protect them from winter damage. Please tee the ball from where you would like to play during this time. This will help to reduce wear and tear on our teeing surfaces as well. Over the next couple of months, we will be bringing in our trash cans and the tee signs for painting as well. We have left three ball washers on the first, 3rd and 6th holes on both 9's and filled them with windshield washer fluid to reduce their potential for freezing. We will continue to clean up leaves as they fall and temperatures allow us to get out on the turf. We have some tree removal planned and hope if some moisture gets into the ground to get some rough aerating completed if possible. Still a great deal of work to get accomplished before winter sets in. The Pro Shop Holiday sale will be Dec. 4-5 in the clubhouse. Barrett and Abby should have some great deals for your Holiday shopping needs. Gift wrapping as always will be available. With nice weather predicted for the weekend, we will be allowing Carts On Fairways and Off the Paths for this special holiday weekend only. Come out and see us! Happy Thanksgiving to all of our membership and staff @Glen Echo. The clubhouse staff has been working feverishly since Tuesday preparing the dining areas, take out orders and a nearly full clubhouse of members, family and guests for Thanksgiving Dinner setting. I would also like to take a moment and mention the beginning of Hanukkah for those of the Jewish faith which started last night. To everyone, I hope your day is filled with good food, fellowship and take just a moment to reflect on how blessed we are! Andrew Morris from Country Club of Peoria penned a great read regarding tornado ravaged Hillcrest G.C. in Washington, Il. Unbelievable devastation at this course. Contact the pro shop to sign up for the Men's Golf Association last event of the year "The Turkey Day Scramble" on Friday November 29th at 11:00 a.m. Looks like the best weather day in 7 days will be Friday. Sign up as an individual and get paired by the pro shop or bring from one up to three guests for a $ 30.00 per guest fee. I'm giving one last chance to have carts off paths since the course is reasonably dry and the forecast is trending for more dry weather so no excuse for the cart playing golfers. Get out of the house and come have some fun at the club on Black Friday! Course should be in good shape. Staff are working on cleaning up the leaves that fell during the last storm and over the weekend. As mentioned in an earlier blog posting, we over seeded half the long range tee in mid-fall. We had sprayed a selective poa management material on the tee in September to clean up the early germinating poa annua and then rotary spread an average rye grass rate over the tee. No fertilizer since the bermuda was still green. We drug in the rye grass and mowed without baskets. No scalping of bermuda like they do in the south. We were not helped in germination by the dry weather. We did water some to allow the rye to germinate but not enough to encourage more poa to germinate. This would have also softened the tee leading to more damage than necessary going into winter. Once winter breaks next March and the turf begins to grow, we should get a good jump in growth of the rye on this tee with a dormant fertilizer application. We will keep the non-over seeded side closed until it begins to grown and can repair itself which will be probably in late April/early May. Not a Florida style over seed but should be adequate for us next spring as the rye begins to expand. We will also be filling divots with sand and rye as they occur in the spring. The right side which is in more full sun and was not over seeded should give us some good mid-spring bermuda if the weather warms properly. Less competition in the spring should also assist the bermuda in greening more quickly. done. Stick removal and leaf mulching of the club lawn. Only .35" of rain, not enough but helpful. We will take what we can get going into winter. Trade journals either in paper form or digital. Forums on professional sites such as TurfNet or Superintendent Association site. Monthly local meetings or visits to golf courses. Vendors or field reps from companies talking about their products and solutions or problems we might be seeing. Turf advisory visit from USGA agronomist which occurred this season. Webinars presented on different sites. Today with the wet and cold weather, I sat in on a webinar presented by TurfNet(Internet Golf Course Communication Company) which was present by Dr. Frank Rossi from Cornell University regarding Plant Health. Superintendents from all over the country sat in on this power point presentation regarding the health of golf greens and how the impacts of our work impact their plant health. Many times, these presentations spend most of the time discussing how we can improve plant health without using chemicals to fix or cure our problems. There are many cultural practices which can improve and or negatively impact plant health. In many cases its about proper application, operation and timing. Get one of those three out of order or sequence and problems can occur. Keep those in the proper order, and great putting greens can be in your future. One of the most interesting slides he used during his presentation the production of energy and the use of energy in the plant. Last week, in the discussion regarding trees I spoke about shade weakened turf on greens and how they can become deprived of energy during the summer. During the webinar, a slide was used by Dr. Rossi that relates to energy production and use. The yellow line which represents use peaks at the top in the summer. The white line which represents production bottoms out directly underneath the use line in the middle of summer. Dr. Rossi', Conrell University's slide regarding production and use of energy. There are many abiotic(non-living) stresses in turf which can negatively effect the production of food and the use of food. Too much or not enough depending upon the type of stress can widen the gap between production and use. Our attempt is to keep the gap as narrow as possible so when the worst weather of summer comes along, our turf is prepared. You can also see the blackened areas which represent storage. The greatest time for storage in a plant is during the fall. The sun's angle in the fall is flattened which reduces light. Trees living on the eastern and southern sides of greens negatively effect this storage because of reduced light. Leaves are usually on trees until November so any trees close to greens on the sun side of the green reduces the greens ability to build up reserves going into winter and the following spring which are terribly important for plant survival the next summer. I missed a number of webinars this season and intend to go back into the archives and watch them Hopefully I can learn something new or refresh some information that gets pushed down in the memory bank to assist the staff and I as we hope to keep your golf course in great condition again next season. 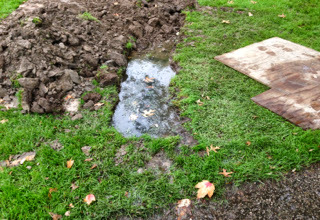 Every late fall, we blow out our irrigation system to insure that it is protected from potential winter freeze damage. We rent a large compressor that pushes a column of air through the system. The heads are turned on using the control boxes which are the green plastic boxes that are about 1 1/2' square and stand about 3 1/2' tall in groups of 2-4 that you see all around the course. We manually turn on every head through the control boxes to evacuate the water from the system. Before the event today, we opened 4 valves that drain into our lake system to remove water from the system. We also opened our wash pad drain for this side of the course. The more water we drain manually, the less water that has to be drained through the heads which helps to prevent damage. The compressor''s pressure is regulator controlled to 50 psi which protects our system from potential damage from too high of pressure. Our system runs at an operator pressure of 130 psi when full of water. Running a compressor with air at 130 psi would be catastrophic for our system. High pressure air can damage heads or pipes. The compressor we use provides a large column of air at lower pressure which helps to push the water out of the system in a safe and efficient manner. The system will be recharged in March when we have a need for water which is usually before our spring aeration. Compressor outside the pump house ready to blow out the system. Sprinkler heads turned on with water evacuating out the irrigation lines. End of the day, air being released back out of system after the job was completed. Continued leaf work and a little preaching about shade on greens! With the winds, cold temperatures and natures timing, leaves are falling at great numbers than we can remove. The staff are out trying to clean off greens and our bunkers today. I know they will not get finished since we had to delay our start because of frozen turf grass. Tomorrow, we will begin to clean off fairways and move material into the rough areas. We will be utilizing 2 blowers, the vacuum, at least one rough mower for mulching and probably at least one or two guys doing greens and finishing bunkers. We attempt to grind up as many leaves as possible which do provide some nutrition and soil tilth. 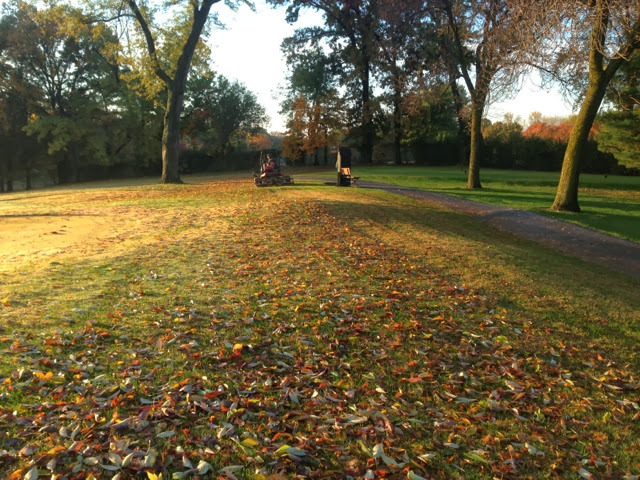 Too many leaves ground up in one area can smother grass, change pH of the soil and create additional layering for our grass which can restrict growth. This is why we use our vacuum to pick up and remove large quantities of leaves. Once the leaf work does slow down, we will begin to pull plugs in the rough to improve water penetration and turf health. This will help to increase freezing and thawing cycles within the turf which leads to the soil becoming more fractured. The heaving of the soil improves exchanges of gases and root development in the soil profile. We plan to pull cores in the rough until the ground freezes and in late winter/early spring when turf thaws. This will strengthen our plants for the summer heat by improving moisture movement through the soil profile and at the same time allow for moisture retention due to millions of small water holding holes in the soil. The more water that can move into the soil, the deeper it can move which will strengthen the plant through improved root systems. As in trees, the more branching of a root system, the greater the water/mineral uptake and the more production of energy which then leads to more growth. Excess energy is then stored within the plant. This storage becomes most important in the heat of the summer when plants naturally protect themselves from the heat by slowing their growth. When you slow production, less is available for the plant to survive. The larger reserves, the better chance and plant has to survive stresses such as heat, disease, insects, mowing, walking, golf carts or having a divot removed.. Leaf removal from 7 green. Also notice heavy shade from trees behind green. The trees behind 7 green are not the worst because the green does get good morning sun but are becoming an issue because of their southwest location to the sun''s track across this green. Air circulation is good to this green because of it being in the open and elevated which does improve its overall health. FYI, these trees are not on a list for removal but they are beginning to create the potential for health issues. Allow me to shift gears for a couple of paragraphs since we are talking trees. Most superintendents are not judged on how they can grow a tree. Warning, editor opinion. (Pretty easy, plant to grow, keep mowers off of it and watch it dominate its landscape unless a disease and or pest takes it out. In most cases, they are pretty bullet proof) Superintendents are judged primarily on how we can grow turf grass, specifically golf greens. In a nutshell, that is why I'm so concerned about the competition created between trees and grass. During ideal summers when there is reasonable amounts of moisture and milder temperatures, heavily shaded poa annua infested greens are not much of an issue. Poa annua is a nice rolling surface except for the seed head disruption in the spring. Its when we have a horrible summer like 2011 with high temperatures, high humidity from heavy rains and saturated soils when our turf suffers the most. The plants have not been able to store as much energy as they should because of shading and or competition from tree roots. Green root systems are less branched and become lazy because of excessive moisture from poorly draining and slow to dry shaded turf which means less food production is occurring during the build up to the summer. Its then on like Donkey Kong. High heat increases soil temperatures. Water is a great conductor of heat and with heavier rainfall, the green profile does not release the heat like it should. As soil temperatures increase into the upper 80's and then 90's, the plants begin to lose root structure. Cells begin to die one at a time as do the root that is made up of these cells. We talk about roots shortening which does naturally occur during an average summer but can be exacerbated due to compromised and unhealthy environments leading up to the severe weather conditions. The higher the temperature, the more severe the impact on the plants. Poa annua root systems already shorter by biology then bent grass, suffer more severely because of this shorter root system. More water is necessary to keep it cool but then their is too much water for the bent grass plants. Bent grass, normally the stronger plant is weakened, has fewer numbers because of competition from the poa annua and poor growing conditions. In most cases, poa annua will colonize greens in certain areas. High moisture concentrations and shade are the two biggest factors. The higher areas of concentration of this weaker plant species, the greater potential for larger areas of damage due to heat, excessive moisture and or disease. Less root structure means less water/mineral intake. The plant then overheats because it cannot cool itself. In a way like humans, the plant basically goes through heat stroke and or exhaustion. The plants systems begin to shutdown one at a time until it finally dies. Root diseases can also begin to show their ugly head. This type of stress require chemical applications which are generally very expensive and require the highest labeled rates to apply and usually more than one treatment. These applications can negatively affect the microbial populations which help to breakdown nutrient products and make them more readily available for the root systems to move into the plant. At a time when the plant might need to be stimulated, this process slowed because of reductions in the life within the soil. Golf greens are made up of about 2000 plants per square foot. Below is a hypothetical example. 200 sq feet of turf loss x 2000 plants = 400,000 plants. In most cases when areas begin to die or suffer, the leaf or leaves from one plant only die back to the crown where new leaves will regenerate. If the weather changes for the better, damaged areas can heal fairly quickly. If weather severity continues, the damage can continue to spread. Sometimes, damaged areas require changes in maintenance practices to encourage healing which includes reducing mowing schedules and or raise the height of cut which can negatively effect ball roll. When death does occur, that's when we have to seed into areas and or replace the damage through plugging and or sodding. Okay, enough proselytizing for one session. Need to go out and help the staff remove leaves!! Large oak behind 11 green in which its limbs now reach to back edge of 11 green. This green has reduced morning sun due to tree line along cemetery. Selectively removing trees could improve its morning light issues. The green does sit down and is blocked from air movement because of the pine trees behind the green which are necessary due to the 12th tee which in direct alignment with the path as it goes behind 11 green. 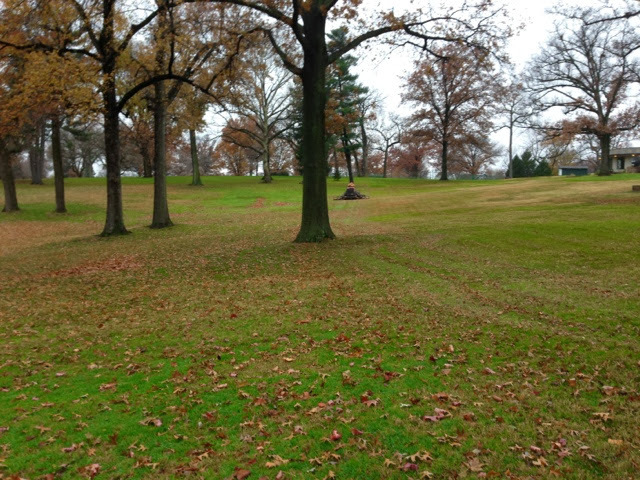 Also located next to the cemetery, the abundance of trees in the cemetery also reduces wind movement into this corner of the course. The green is also flat which reduces surface water's potential from moving off of green. Indoor activities beginning to heat up at Glen Echo! With the golf season winding down and weather beginning to force many of us indoors, there are a number of activities both for couples and families that you should mark on your calendar for the next couple of months. Nov 15 Beer Dinner with a Brew Master from Ferguson Brewery in the house for the evening! 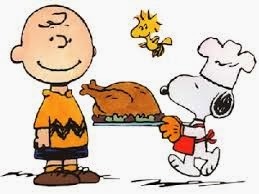 Chef Terry and Jeff also provide carry out for your family needs to help you with your Thanksgiving Dinner celebrations. These events are on the calendar and ready for you to sign up. The December Holiday Calendar is getting pretty full but there might be an evening or two open so if you want to do something for your company and or family and friends, contact Rob. Also, great opportunities for lunch events for your office staff, friends and or family gatherings before the club closes for the Holiday break. Reservations would be very helpful to assist the staff in taking care of your groups needs as well as the events that take place each evening. As we must prep the golf course for events, there is so much prep that takes place in the kitchen for the day's activities to be successful. Chef Terry also provides carryout food for office parties or family get together's for the Holidays as well. Why go to the grocery stores when you can get the best food in town from the Glen Echo kitchen!! We've had a great season on the golf course, its now time to fill up the clubhouse for the next couple of months!! 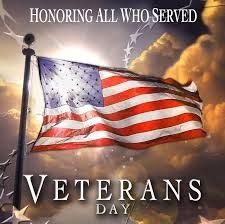 Happy Veteran's Day to all who have served our country and continue to serve to provide the freedom we experience everyday. 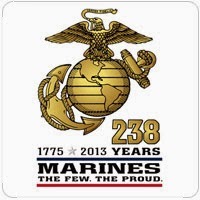 I always try to recognize the Birthday of the Marine Corps. Happy belated birthday to the Marines! Softened conditions which contribute to bigger ball marks, spike marks and poor ball roll out. Removes oxygen from the soil and creates a anaerobic or oxygen deprived soil profile which contributes to poor root systems and easily damaged turf. Encourages disease both surface borne and root. Encourages poa annua to become the dominant turf because it loves excess moisture. Elevated soil temperatures during the summer heat which can damage root systems. Moisture is a great conductor of heat. One of our worst greens for this issue was #5. I was hoping to get this situation corrected last fall during the bunker project but we were just too strapped for time. The moisture from last week softened conditions enough today and we tackled the problem right before lunch. We removed one pass 18" of green height sod from the front of 5 green since it was beginning to elevate up to the collar. We removed about 12' of collar/approach sod and laid it out to use over once the soil was leveled. We left about 6' of sod on the outer edge of both sides of the approach. Once the sod was removed, we took out 1-3" of excess sand which had built up over the years. Upon removal of the sand, the sod was laid back in place. We will be lightly sanding the sod cracks to reduce the potential for the sod to dry out and will do some light topdressing before winter sets in. Once the turf begins growing again next spring, we will do some additional smoothing of the surface with sand. The overall health of 5 green should improve with the evacuation of excessive water from the front area of the green. Staff cutting pieces of the approach on #5 and laying it on the boards in the order it was removed. After the sod was removed, we hand shoveled and raked the area smooth. We then used our laser level to insure the water would move away from the green. Once that was complete, we used our compactor to smooth the surface of the area before laying the sod back in place. Of course Lady is checking out our work as usual! She did approve. 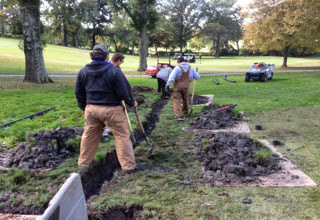 The staff edging the sod back in place to the existing grade on the side of the approach. As you can see the green does slope from back to front but does flatten out at the front of the green. When we pulled the row of sod off the green, there was a anaerobic black layer of disgusting smelling sand in the front of the green. The fronts of our greens do have a tendency to hold extra water since we do not have drainage but they will not hold as much with water being able to move more freely off of the green with the lowered collar during rain events. The finished product. This area will be painted as Ground Under Repair. Please walk around this area the rest of this season and please move your ball from this area before playing your next chip or putt. Our seasonal staff have finished or in the final stages of their work year here at Glen Echo and I wanted to thank them for their efforts this season. Randy Brown who came down here about 3 years ago to supplement the work he was doing with the housekeeping staff worked full time for us this season. Randy within the last week found another job which will offer him full-time year round work with benefits and we are happy for him. You still might see him working banquets at the clubhouse on the weekends where he will fill in and help Reid. Michael Geiger began working in early summer for us when we lost a staff member or two. You know Mike from the pro shop and caddying over the last few years. This weekend will be his last week for us. Michael did a great job for us this year. Jeff Hasekamp has one more week left. He's done great work for us again this season. He's been around the business since he was a teen with his Uncle Dan who was the former super as most of you know. We can always count on Jeff's efforts. Becky and Nick will be leaving toward the end of the month for the season so they are here for a few more weeks before they are laid off. In regards to Becky, she is dependable and you know you will get her best effort in taking care of the horticulture operation here at Glen Echo. From time to time I might have an opinion about something but I learned a long time ago when someone works for you and they know what their doing, get out of their way and let them do their thing. We provide support for her on occasion but about 99% of what you see out on the course when it comes to horticulture comes from her expertise, drive and sweat. Nick spends most of his time spinning around the course on the rough mower which is a mind numbing job. A few hours out on the mower and I think I get a little delirious. He's out there for 32-40 hours a week on a big, noisy, dusty and dirty mower. Thanks again to all of our staff because without them, I'd be a crazy little short guy running around not knowing which end is up. Our leaves appear to be a couple of weeks behind in changing colors. Along with that comes the clean up after they fall. We've had some clean up over last couple of weeks but have a large under taking over the next few days with the lead drop from the rain. It's a little wet in areas which prevents us from using our wide area mowers right away. We are trying to get the green and tee complexes cleaned up first. The staff will spend their weekend work time doing some wide area mowing and blowing to help clean up the course more thoroughly. We appreciate your patience during this time. Also, a majority of our seasonal help are at their lay off weekend so we will be reduced by 3 additional staff members beginning next week. Leaves next to 3 tee and 2 green. Some of you might have noticed last week that we covered our collar nursery with a white semipermeable cover. I had the staff put the cover on last week because of the cold temperatures that were predicted. The green had started to germinate but had not begin to fill in so the cover was put in place to artificially increase the temperature of the soil as well as protect the new seedlings from a hard frost which would slow the new growth. With the warmer weather predicted this week, we have removed the cover to allow the turf to grow, add additional fertilizer and to apply a fungicide to protect it from disease which can occur during a new grow-in of a green. Collar nursery after the cover was removed. I love the weather of fall because our golf course is usually in great shape. It also is an opportunity to see the final displays of color from our ornamental plantings which were outstanding this season. A little slow at the start from the cold wet weather but everything looked great throughout the property by mid-season. From what I heard, the ornamental peach tree at the field bar was a big talking point from a number of members. Becky started the process of removing the ornamental plantings from this summer's displays over the last couple of weeks. The frost of last week took care of the remaining beds that were displaying great color. She has been planting fall material in the pots at the entrances, patio and pro shop. She's also busy planting in various high profile beds for some fall display as well as early to mid-spring color. Becky has also brought in a 1000 new bulbs for planting in various areas as well. New plantings along the flag pole bed. Ornamental grasses, pansies, and Mums. Tulips, daffodils and a few other surprises for next spring. We have closed the long range grass tee for the season. The mats will be open for your use. 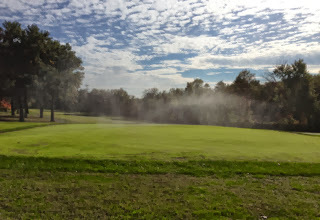 The short range grass will be closed after November 3rd. It is my understanding that 4 new winter range mats will arriving soon. 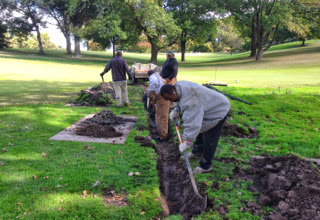 The grass tees are closed because the turf is not actively growing and cannot repair itself. We have overseeded 1/2 of the long range bermuda tee for early spring use next season. The zoysia/bermuda part of the tees will be reopened next spring when growth begins and we begin to mow the tees. Every fall, we face the decision when to permanently place cart on paths for the winter(dormant) time of the year. Carts on paths in the winter protects the turf from wear and tear when it is not actively growing. This wear and tear can contribute to late break in dormancy. Severe compaction can lead to weakened and or dead turf. Carts also driving on fairways in the winter can flatten the dormant turf making for less than desirable playing surfaces in the winter season. Our greens aeration was completed before the rain set in late Tuesday morning. Due to the excessively dry conditions, we did not punch the front approaches to the greens. The depth set for the project was too deep and would have damaged the approaches/collars due to the dry conditions we have experienced over the last few weeks. We will punch the approaches as soon as the ground gets soft enough, hopefully in the next few days with the predicted rain coming in Wednesday night into Thursday. We completed greens Pg, 1-3, 5-7, 9-16 on Monday. Greens 17-18 were punched Monday but were not completed in total until Tuesday morning. 4 and 8 were initially skipped on Monday because they had gotten very firm over the last few days and needed an extra day of irrigation to reduce the potential for severe surface disruption. They were completed Tuesday. The rains came right at the time we finished the last green. Our process included laying the sand on the greens first. This prevented the heavy topdressor and hauler from leaving tire ruts across the green when it was already aerated and the surface softened. 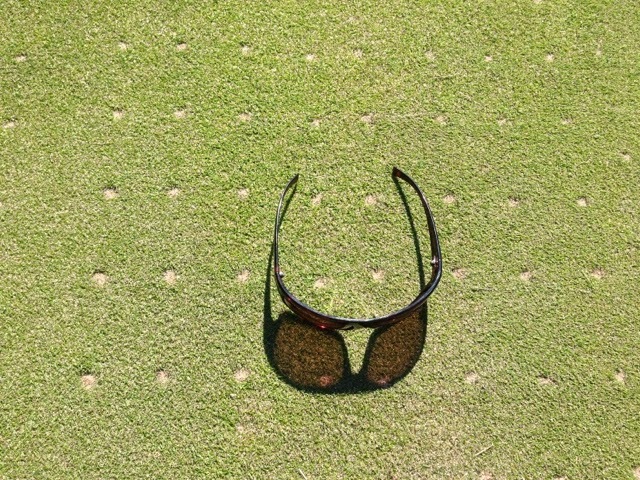 We then used our Redexim 7316 Vertidrain punching holes on average 8" deep with 1/2" tines spaced about 3" apart. This placed about 1.5 million holes and or channels in our greens surfaces and down through our aged soil profiles. We normally use a spin attachment during our normal topdressing which we are able to apply a small amount of sand over about 4-6 greens. We used our brush attachment during this process which laid a heavy band of sand much heavier than our standard topdressing layer. About 1 to 1 1/4 topdressor loads per green. We applied about 35-40 tons of sand to the 2 acres of green surfaces that we have. It would take about 30-40 minutes to aerate each green depending upon the size. We then applied a product called Renovate Plus from Earthworks which provides a number of products in one bag: Approximately 50 pounds per green more or less. Dry Kelp Meal, seaweed is a great stress reducing product for golf greens. Zeolite which posses the ability to hold plant nutrients for efficient plant uptake in our straight sand topdressing. We then used our smaller pull behind blower to blow the sand into the holes as well as employees with backpack blowers to speed up the process. This would take about 30-45 minutes dependent upon the amount of staff we had and the size of the green as well. The greens were then brushed to smooth the remaining sand on the surface of the green. We then rolled the greens surfaces to smooth over the holes and the surface of the green. The aeration provides a number of benefits for the greens. Allows water to penetrate more quickly into the green profile. Exchanges gases with oxygen penetrating into the root system and Carbon dioxide which can build up in the green profile to exit. New channel for roots to move into more freely. Replaces the very fine sand that was originally topdressed with to a larger particled material which will allow water to move more freely through the profile. Drier and firmer putting surfaces which improve ball roll. Replaces and reduces thatch which can build up fron dying plant material. Russ with the Verti-drain aerator. Staff using pull behind blower and back packs. A majority of the sand stays on the green and goes into the holes on the green. Did not get the brush in action but the brush that is pulled behind the cart to smooth the sand on the greens. Jeff rolling the completed green. We were delayed by frost this morning but once we got going, the staff did a great job in completing 15 of our 19 greens. Everything was completed except 4, 8 and 17. 18 was aerated but not topdressed. 4 and 8 were not aerated because the greens were too dry and could have been damaged. We should get 17-18 finished tomorrow if the rain holds off. 4 and 8 will be completed as soon as we have sufficient moisture to prevent damage. Check out the article regarding golf course dogs. Lady made the publication! Frost/Freeze Delays, Here they come! As mentioned in a email blast last Friday, frost delays are upon us. Something none of us like to experience but a necessary requirement to protect our turf from damage. Delays occur because of the frozen dew that attaches itself onto the plants. We ask that all golfers do not begin their rounds until after the designated tee times for this time of year. These times are put in place to protect your facility and create as little inconvenience for our membership as possible. 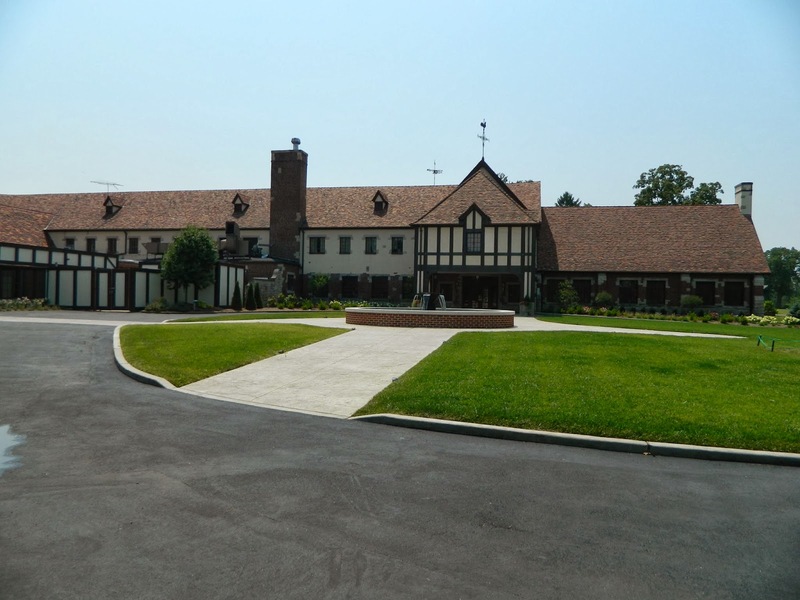 It is important for all golfers to check with the pro shop for the okay to use the ranges and or putting green before starting their day at the club. Normally the putting green is one of the first surfaces to clear being at a higher elevation and near the parking lot which holds extra heat. Guidelines for you to follow are when predicted temperatures are to be around 40 degrees or below, the chances for frost to occur are pretty good. Especially since our first hole is one of the lower lying areas of the property. We will try to give the pro shop an estimate on the frost delay if at all possible so if you look outside your window at home and see frost, more than likely there will be some type of delay. Below is a great video from the USGA regarding frost delays and the importance of staying off of the turf areas until the frost lifts. We've mowed the greens nursery 4 times since last week. Currently mowing as needed(twice per week). It is being mowed at a height of .210" with our walk mower. It has been topdressed this week and fertilized weekly over the last 3 weeks. The collar nursery green has just started to germinate. Took a couple more days longer than the greens nursery due to cooler temperatures. Water just finishing on the greens nursery. For the last two seasons, I have not overseeded the Patriot bermuda grass long range tee with ryegrass. Poa annua had invaded the tee along with crabgrass and goosegrass. In an effort to reduce some of the effects of these weeds, in the winter of 2012 we sprayed an application over our dormant bermdua like we do our fairways and tees. The crab/goosegrass premergent and RoundUp application was very successful in reducing these weeds. Luckily, the early warm up of spring allowed our membership early access to the bermuda because it had greened up so quickly from that early season heat. Last year, I decided to do the same thing but did not have good early spring conditions. The cold damp spring caused us to keep the grass tee area closed since the turf was very slow in coming out of dormancy. Conditions were very wet which would have allowed very few days on the tee but I decided this season we would get back to overseeding the tee. . I sprayed a material in the early fall which should kill some of the early germinating poa annua and allow the ryegrass that we overseeded on the tee to flourish next spring. Of course, we will get some poa annua to probably germinate and invade the area. We seeded 1/2 of the tee that is closest to the parking area which should be enough teeing space for the earlier spring play. I seeded this section of tee that has reduced sunlight and is usually slow to come out of dormancy anyway. I wanted to keep the stronger area of bermuda ready for next spring in case we had an early warm up and it would grow faster and be ready to hit off of sooner if we received above normal conditions. So this spring you can look forward to having turf to hit from once the tee is dry enough to allow play. I wait as long as I can before the greens are aerated at Glen Echo CC. Fall putting conditions are usually the best of the year so I try to give you as many days as possible to enjoy but your time is running out. One of the surprising aspects of greens aeration in it current form is that the disruption to the playing surfaces is not nearly as severe as it was years ago. The equipment is so much better and our techniques have been refined to the point that disruption occurs for shorter periods of time and the playing surface is pretty good to play from considering what the greens will have been put through. I think our healing will be very quick since the greens came out of summer in excellent condition. We will be doing our yearly Verti-drain deep-tine greens aeration beginning on Monday, October 28th weather permitting. 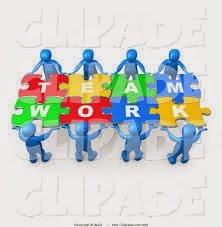 It takes us about 3 days to complete this project with a majority of the work occurring on that Monday. We usually have about 4-5 greens left to complete on Tuesday and Wednesday. We make every effort not to interfere with play but if you come out early on those two days, you might run into the end of our operation. We will be using 1/2" tines and will go approximately 9-10" deep. We will be filling the holes with about 30-40 tons of sand. I expect the greens to be in good shape through that next week. It takes about 10 days or so for them to be back into what I would consider normal shape for this time of year. We appreciate your patience during this most important cultural practice for our greens. The spray applied a couple of weeks ago on our fairways has started to show some results. It has turned the bermuda off color and it is injured. With frost right around the corner, the injury put on the bermuda as it is going into dormancy should severely stunt it as it tries to come out of dormancy next spring. It will then be decision time based on how much zoysia is in the area if I spray it right away. If the area is completely void of zoysia, spraying it again could take out the bermdua completely which would then force us to sod the dead areas which can get expensive. If the area has zoysia in it, we might hit these spots again which will encourage the zoysia to grow because it has less competition and we continue to injure the bermuda. One of the techniques we can use is to spray edges of bermuda which will allow the zoysia some advantage and it would be able to grow back into these spots. Realize that bermuda can out grow zoysia by at least 3 times its growth rate. Mr. David Stone CGCS from the Honors Course in Tennessee told me one time that you will probably never get rid of the bermuda completely. Drainage areas/wet areas or areas that are too shaded will not support healthy zoysia. Bermuda enjoys excess water and can handle shade better than zoysia. I will also be spraying some areas of the rough with an application of our bermuda suppression material which should hurt it going into winter. We will probably do a spray in the spring to reduce its growth in early summer which should make your summer golfing next season not quite as difficult if the bermuda is not as aggressive. This is the area on top of #10 looking back toward the lakes. The area to the right of the brown bermuda extending about 10' or so is part of the fairway and intermediate that is probably 100% bermuda. I did not want to spray all this area at once because if it all went out, we would have to replace it with zoysia. My hope is to injure the reddish brown area giving zoysia the chance to fill back into these areas. We still might have to replace some zoysia but I am trying to keep it to a minimum. This is the area at the bottom of #13. You can see the areas effected from the spray. We've had a significant wet area at the beginning left side of 12 fairway. Yesterday we put a gravel dump with a pipe in it to drain the area. 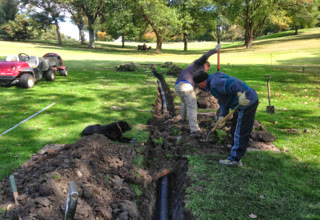 We ran a solid pipe down to the cart path where an emitter was placed on the pipe allowing the water to go across the path into an existing surface drain. The trench still needs to settle and it will then be smoothed and covered with sod. About 100 yards from the left side of 12 we filled it with dirt to help smooth out a severe rut that formed from the irrigation lake splice at which runs to the property line. We seeded and covered the area with a straw blanket to protect it from erosion. Staff hand digging the trench out for the new drainage. Area was to saturated for trencher. Continuing to clean out trench. Water that had already accumulated at bottom of trench line this morning. The right side it the pop up drain that is removing the water from the saturated area. Water draining across the path and into drain line that runs under 3 fairway. Stray blanket to protect new seeded are about 100 yards from #12 green.